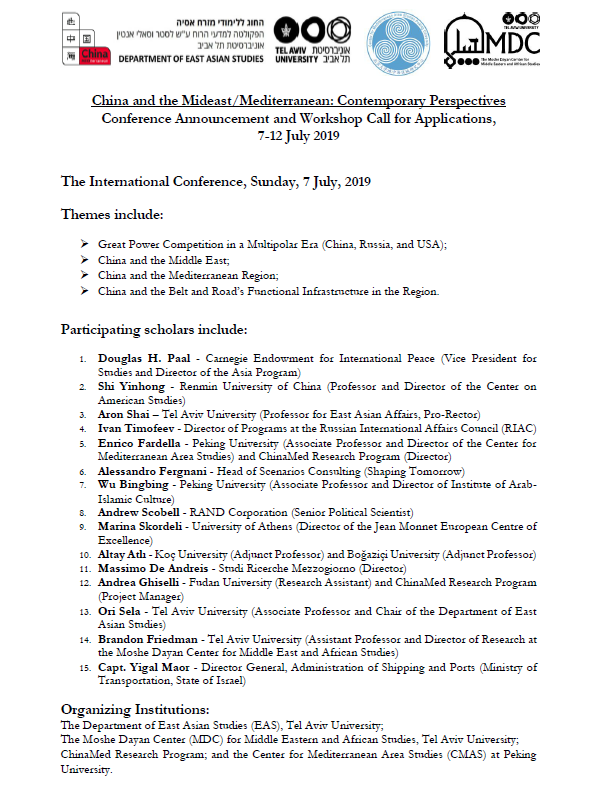 In early July, 2019, the Department of East Asian Studies, Tel Aviv University — jointly with the TOChina’s ChinaMed Research Program, the Center for Mediterranean Area Studies (CMAS) at Peking University, and the Moshe Dayan Center for Middle Eastern and African Studies, Tel Aviv University — will host a joint program of conference and workshop on the theme: “China and the Mideast/Mediterranean: Contemporary Perspectives.” Building on our first “China and the Middle East” conferences (held in June 2018), we invite scholars and graduate students from around the world to participate in an intensive one-week event that includes a one-day conference; a full-day tour; and then a four-day workshop. We see the Middle East and the Mediterranean region as closely connected (past and present), with interactions – certainly involving China – as intertwined. 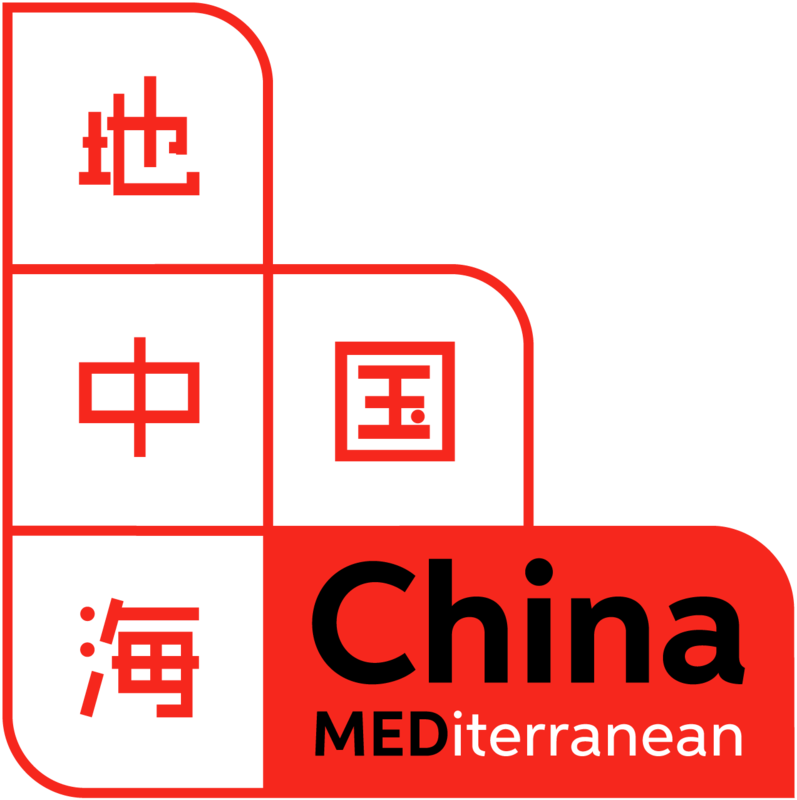 Therefore, we propose addressing the two regions in conjunction, as “Mid-Med.” It is our aim, to establish long-term research and analysis networks, to exchange ideas and promote new research about the various perspectives of China in these regions, both from the inside-out and from the outside-in. In other words, we want to focus on both the ways China understands its role and interests in the Mid-Med, and the ways Mid-Med actors perceive China’s involvement therein. The workshop is intended for a small group of 25 selected graduate students with a background in international and regional studies (Middle East and Asia/China in particular). The workshop program includes six teaching/discussion sessions spread across four days and led by scholars from Tel Aviv University, the ChinaMed Research Program, and leading institutions around the world, who will also participate in the conference. Each session will include two sub-sessions of 1-1.5 hours – two sub-sessions in the morning and two in the afternoon. The workshop will also include Q&A sessions between students and scholars, along with short one-on-one meetings between the scholars and students. The workshop will also include a visit to a contemporary Chinese-related initiative in Israel; and there will also be a short educational tour related to historical great-power involvement in the region. ChinaMed Research Program; and the Center for Mediterranean Area Studies (CMAS) at Peking University. ➢ China and the Belt and Road’s Functional Infrastructure in the Region. Israel is situated at the intersection of the Middle East, the Mediterranean, and North Africa. A crossroads, historically, of both contention and productive interaction between powers from East and West alike. Israel, as the traditional land bridge connecting Africa and Asia, is still coming to terms with the emerging new geopolitical architecture, which may offer it opportunities to create better relations among the regional actors. Our educational tour will combine both visits to historical sites and reflections on a better future for the region, in which China’s role seems potentially dominant. The workshop is intended for a small group of 25 selected graduate students with a background in international and regional studies (Middle East and Asia/China in particular). 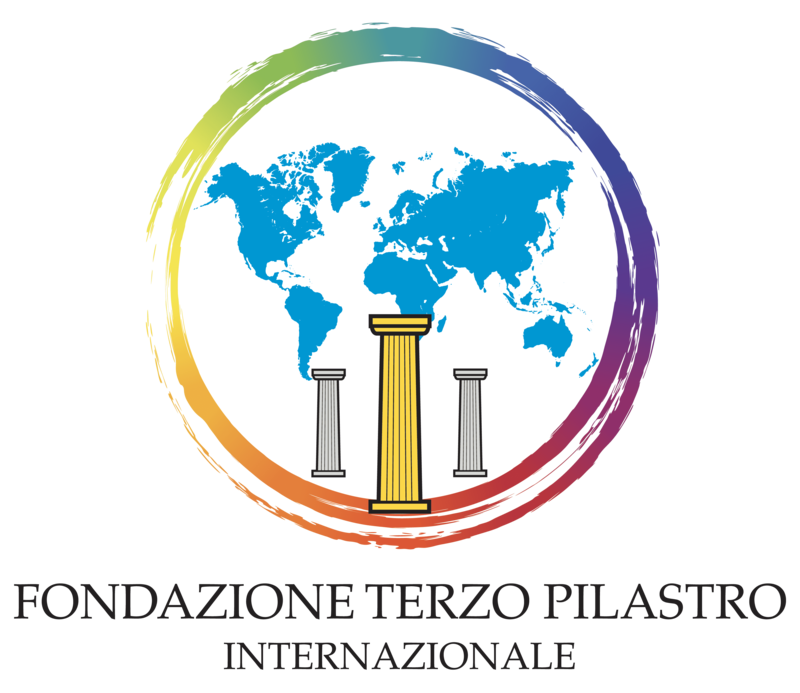 The workshop program includes six teaching/discussion sessions spread across four days and led by scholars from Tel Aviv University, the ChinaMed Research Program, and leading institutions around the world, who will also participate in the conference. Each session will include two sub-sessions of 1-1.5 hours – two sub-sessions in the morning and two in the afternoon. The workshop with also include Q&A sessions between students and scholars, along with short one-on-one meetings between the scholars and students. 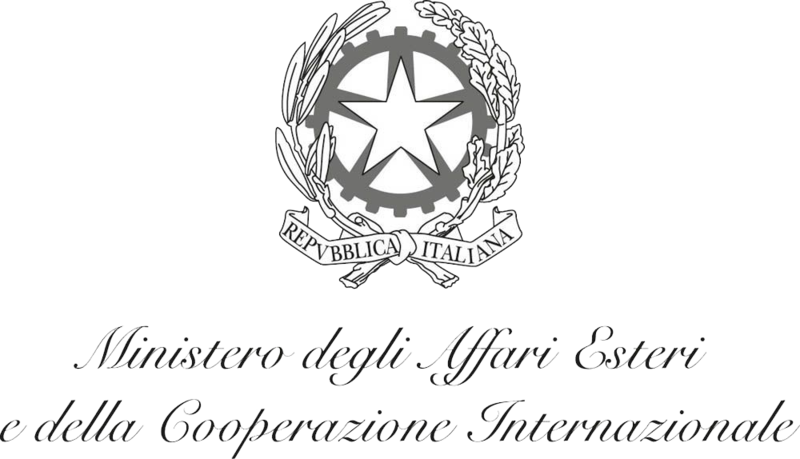 The workshop will also include a visit to a contemporary China-related initiative in Israel; and there will also be a short educational tour related to historical involvement of great powers in the region. The Study Tour is for conference speakers and admitted students only. A limited number of fellowships (covering the expenses for on-campus accommodation, the tuition fee of the workshop, and up to €500 for flight reimbursement) is available for qualified applicants. The number of participants at the Workshop is limited to 25. Deadline for applications: April 28, 2019. A reply will be sent by May 19, 2019. Applicants must be registered at academic institutions for advanced degrees (MA, PhD, etc.) at time of application. • A cover letter with an outline of the applicant’s motivations, research interests, and experience in relevant fields of study/practice (up to 500 words). • One recommendation letter from faculty in the applicant’s current home institution.